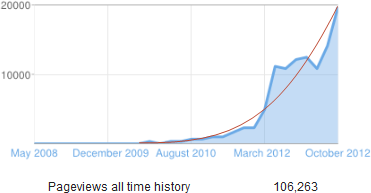 The Revit Add-ons blog surpassed 100,000 pageviews all time in October. Thanks to all of you who have contacted me over the months to let me know that you have found this blog to be a good resource; it makes the work worthwhile, and it's rewarding to see that the monthly pageview count continues to grow. This is definitely one of my regular reads for new Revit content. Thank you for keeping it going!